First of all, I cannot actually believe I am writing this post. 1000 followers?! Seriously where did all you little critters come from? I am so overwhemed to hit that milestone after just 8 months back on the blogging scene - thank you so so much everyone! When I started doing this, having 1000 followers was just something of a dream and I still can't quite believe it - High Five! 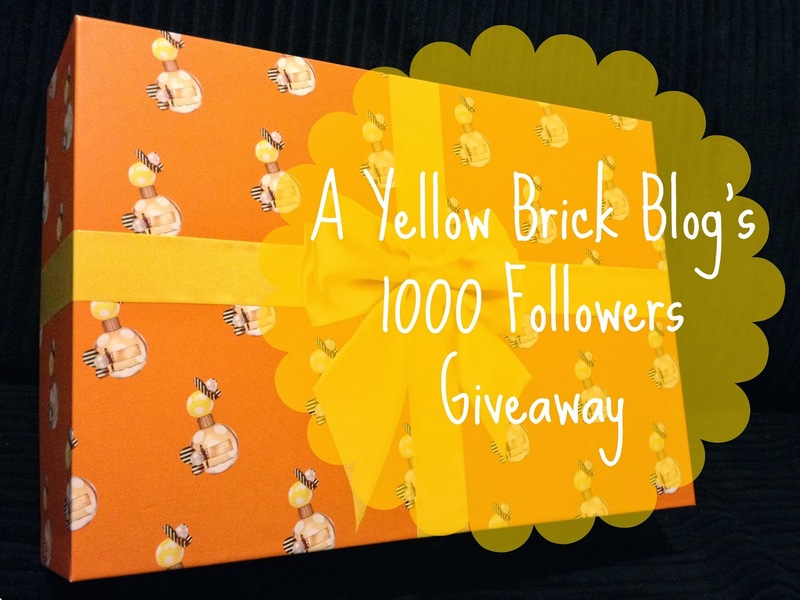 I thought I would host a giveaway over here on A Yellow Brick Blog to show how thankful I am for everyone who has taken the time to click, tweet, comment, follow over the past few months - you guys rock and you've made 2014 so exciting for me already! .... because everyone deserves to smell beautiful! To enter just fill out the Rafflecopter below and cross your fingers. Congratulations babe! such an amazing giveaway aswell, really loves u and ur bloggy! keep up the good work and heres to the next 1000!!!! Congrats on 1000 readers! This is such a fab giveaway, I adore Marc Jacobs perfume! one of my favourite blogs ever,lovely giveaway! It's a lovely giveaway lovely! Well deserved for your hard work and regular posts! I love your videos! I would like to see more about every day things. I'd love to see more makeup product reviews, swatches and skincare reviews. Congrats on 1000! I love your blog, it just everything I look for in a blog e.g nice pictures, interesting posts, cute design! congrats! how about a blog giving advice for men buying gifts for ladies? we can get it very wrong sometimes! Squeeee, you've reached 1000 follows! Congratulations to youuuuuu. I'd like to see more make-up tutorials and product reviews. I would like to see more reviews. Love make up reviews - would love a good eyeliner recommendation !! congrats, would love to see more comps. Yayyy, congrats! :) Oh, and fabulous giveaway! I'm dying to try this scent! Congratulations! Such an amazing giveaway too!! More great giveaways and reviews. I would love to see more hauls! Well done on getting so many followers. I've only just followed your blog but the type of things I like reading on blogs is make up/clothes type posts reviewing and recommending products. Well deserved 1000 followers, I'm pleased to be on board. Congratulations! Love more shopping days! Would love to see more nail varnish or nail art posts. Congrats on 1000 followers and great prize. Congratulations! Tutorials would be fab! Congratulations - I would just like to see more of the same - Fabulous!! I'm loving the Product of the Week so more of them! £1 Glow in the Dark Nail Polish that WORKS! My favourite perfume is actually Daisy by Marc Jacobs so would looove to try this one too! Great giveaway! I always love reading haul posts! I love seeing what others have been buying that I might want too! What a great giveaway, thank you so much!!! I would like to see more collection posts. Defo defo defo more travel diaries and hauls!! Congratulations! I'd love to see more hauls! Congrats Kirstie, Great giveaway !! Congratulations on reaching 1000 followers, what a fantastic achievement! I'd love to see more great competitions like this one. I enjoy your posts and cannot think of anything you could do to improve it! This is a great giveaway- thanks! Don't change anything but my favourite posts are hauls and new products. Some more reviews would be great. Always good to get people's opinions on things. Congratulations on your big milestone! I would love to see more makeup reviews. Congrats to you! x I love to read make up and perfume reviews so would love to see more of them! Congratulations! I would love more of the same please! Congratulations on 1000 followers. I'd like to see more travel.